1100-Deluxe, Hollow Body/Semi Hollow Body Electric Guitar from AlumiSonic. 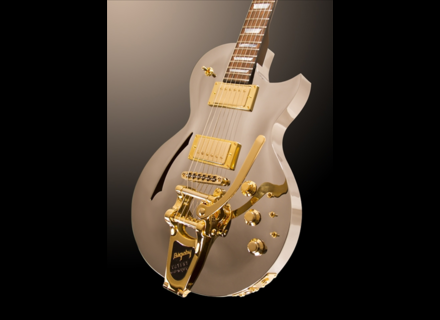 AlumiSonic introduces its new Aluminum Guitar, the 1100-Deluxe. The 1100-Deluxe Aluminum Guitar is a chrome plated, 1100 grade Aluminum semi hollow body with mahogany chambers, formed to classic carved top proportions, with the addition of a sound hole for resonance. Both pickup positions of the 1100-Deluxe are internally backed with nitrocellulose lacquered Honduran mahogany. The 1100-Deluxe also includes the feature of removable Honduran mahogany chamber plugs for a more resonant hollow body sound, according to the company. Custom designed per order, each 1100-Deluxe mahogany neck is available with a variety of back contour, fret and fingerboard choices and Mother of Pearl inlay options. The 1100-Deluxe also includes AlumiSonic's wood to aluminum, set neck mounting system. The mahogany neck is internally bolted down to a machined aluminum dovetail mount, with the added feature of a smooth back with no visible screws. 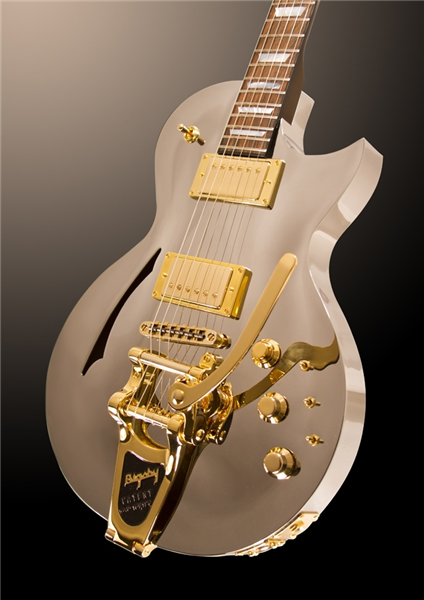 The 1100-Deluxe can also be made with the choice of a Bigsby B-7 Tremolo or standard two piece bridge. Additional custom features available include Piezo and Midi output options, as well as AlumiSonic's new custom stacked Bell Knob for concentric control. Visit www.AlumiSonic.com for more details. Quilter MicroPro 200 Guitar Amps Adds New Models Quilter Labs expands the MicroPro 200 family with a new 10-inch amplifier model, a 12-inch model and a head. [NAMM] Lâg Arkane & Imperator Series Lâg announces the U.S. debut of two solid body electric guitar series, Arkane and Imperator.